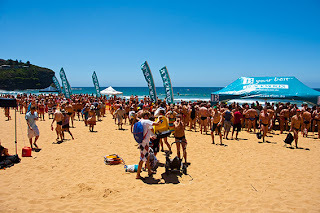 Signed up for the Bilgola ocean swim today - on the basis of a conversation with a colleague who joined me in my madness. 1.5 kilometres between the headlands of North and South Bilgola. Cracking sou-easterly wind and more seaweed than populates the gardens of Atlantis (presuming the legends to be accurate). I, of course, wished for a small surf with infrequent waves. Only had to duck under 4 times to get past the break- and unlike yesterday could catch a full breath between them - but had to run through about 2m of solid seaweed to get to the break. I think I looked like a creature out of Harry Potter by the end. We started in waves: white, yellow, red and green but by the end we looked like and endless procession of traffic lights. Suprisingly wasn't the last out of the water - being in the first group probably helps with that. People had warned me that ocean swimming is like organised chaos. They lied, it's just chaos, people swim into you, over you, around you and under you. It's hilarious because unless you are excellent at swimming in a straight line for the 10 strokes between sighting your mark, we're all interweaving like some bizarre version of a maypole dance. 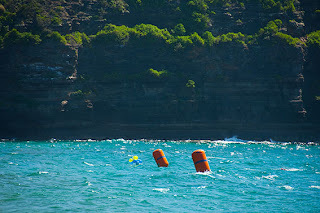 You're protected by the headland for the first two buoys, but between the second and the third you are totally exposed and swimming straight into the waves. Getting a fix is impossible most of the way so I focus on the cliff. And the profound beauty of the vast expanse of water beneath me as the ethereal light dapples and dances on the endlessly shifting sands. Couple of jelly fish. Unfortunately useless as floatation devices, darn. Couple of inconsiderate folk breastroke, particularly around the buoys. This is a big no-no in ocean swimming as your kick extends well beyond your body, generally into the person behind you's face. 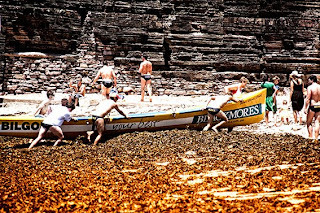 Made it back through the break, and the seaweed, only to race up the beach. God running through sand is tough. It's like ... running through quick sand. Funny that. Rescued by parentals and sister taken to lunch. All of whom are convinced they could never do that - I didn't think I could either 6 weeks ago. Have totally earned dessert so have two. Yay!